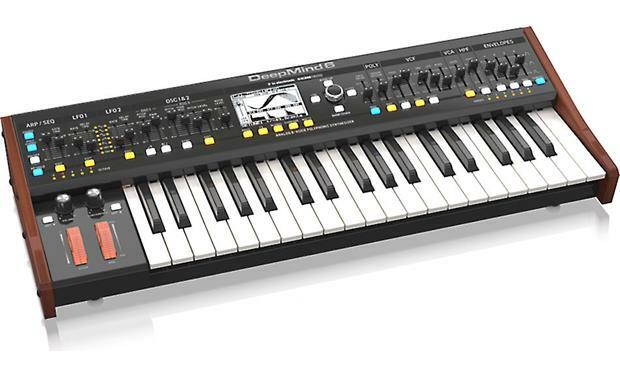 Read more from Crutchfield writer, Michael S.
Written by Crutchfield's Michael S.
I have to say that Behringer has knocked it out of the park with the DeepMind 6 – an innovative, easy-to-use, great-sounding, and great-feeling instrument priced well below similar products on the market. 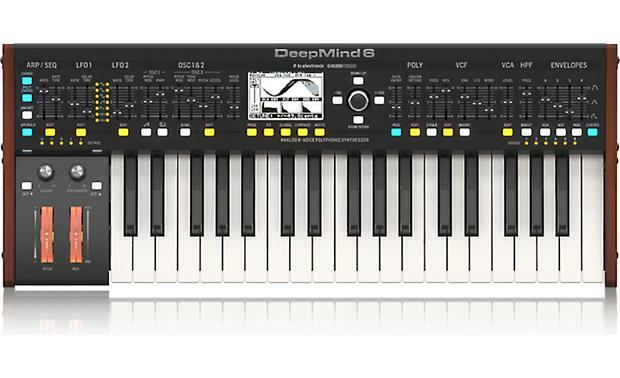 The Deep Mind is definitely a breakthrough 6-voice polyphonic synthesizer, selling for hundreds of dollars less than similarly featured instruments. Simply put, you can't find a full-size polysynth like this at anywhere near this price. 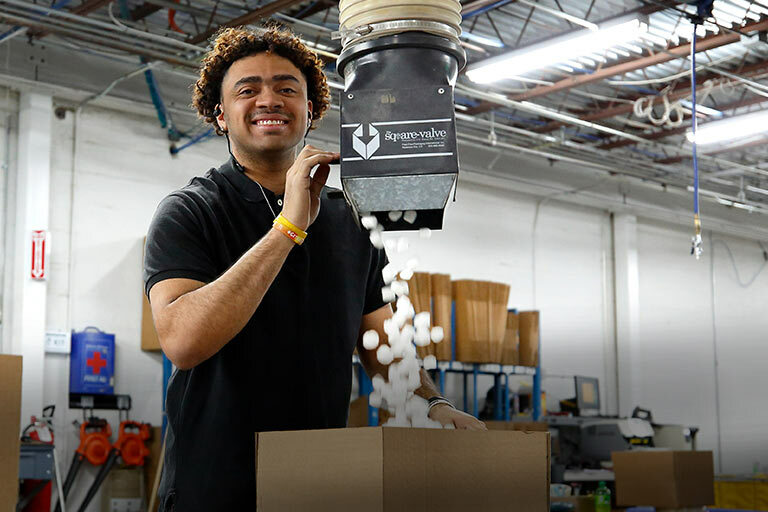 Behringer pulls off this powerful value proposition by combining prodigious engineering chops with the vast resources of their parent company to produce a high-performance keyboard instrument at a budget-friendly price. As a lifelong student of subtractive synthesis, I know that it takes a while to unlock the secret powers of any instrument. Usually, it takes some deeply thoughtful knob-twiddling and a nose dive into a thick owner's manual before any sort of beauty can issue forth from the machine. Not so with the DeepMind: I was awash in rich textures and sweetly pulsing rhythms within seconds of plugging it in. Don't get me wrong; the synth will certainly reward diligent research and practice, but it's not a requirement to access some pretty cool sounds pretty quickly. For me, the preset programs aren't usable and I find myself needing to deconstruct and reconstruct them immediately. People who like brash and in-your-face sounds may well be happy with the factory patches; but I generally go for more velvety sounds that blend well with acoustic instruments. At any rate, the machine can go there quite readily; don't base your judgment on the Behringer's sounds by simply cycling through the presets. It's an analog synth, for goodness' sake; the experience is all about making new sounds. And making new sounds is a joy with the DeepMind. The controls layout mirrors the analog signal path from left to right, for easy and intuitive operation. In the middle sits the beautiful and easy-to-read display that serves as your operational home base. Every action you take is graphically echoed back to you here, keeping you grounded and allowing you to check out your patch at a glance. You'll find edit buttons below each control bank that take you straight to the parameters you want, rather than forcing you to navigate complex menu systems. Thanks to this simple editing mechanism, the logical layout of the hardware controls, and the brilliantly informative-yet-easy-to-grasp display, I was able to find great sounds easily right out of the box without having to consult the owner's manual. and a sophisticated modulation matrix with 19 sources and more than 130 destinations lets you route your own parameter change circuits – just like you can with a modular synthesizer. 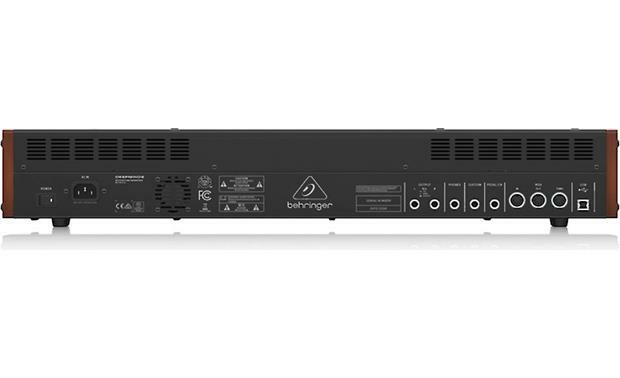 And for those times when you need to bring out the frequencies near your low-pass cutoff point, Behringer includes resonance control – another helpful arrow for the synthesist's quiver. And as most analog synthheads can attest, generating arpeggiated patterns and building compositional sequences are great ways to make a machine's sounds come alive. There's nothing that gives me greater pleasure than using an analog synth as my “drum machine” when jamming on multiple keyboards. So I'm seriously loving the easy access that Behringer provides to the DeepMind's multi-pattern arpeggiator and a 32-step sequencer. The knobs, buttons, and sliders are all solid and smooth to the touch, evoking real build quality – a sense that's reinforced by the beautiful wood panels on the sides and metal chassis construction. Again: amazing at this price. As for the keyboard interface, I find it to be 37 keys of solid and expressive action – with the aftertouch feel being particularly delightful. For me, the toppings on this tasty synth sundae are the four digital effects engines you can run simultaneously. Most analog synths don't include effects, so I always use delay and reverb pedals in my rig. It's nice to not have to share an outboard processing chain with my other instruments (and I save on patch cords). Legendary Lexicon 480L and EMT Vintage Reverb settings let you dial in lovely reverb effects. Behringer also asked sister companies TC Electronic, Midas, and Klark Teknik to create over 33 effects algorithms specifically for the DeepMind. You'll get additional reverb options, as well as killer delays, chorusing, flanging, phasing, distortion, and many other adjustable effects. 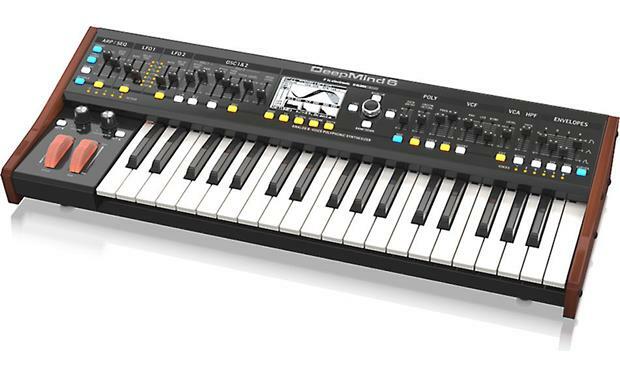 Overview: The Behringer DeepMind 6 is a true analog, 6-voice, polyphonic synthesizer, featuring 2 oscillators and 2 LFO's per voice, 3 envelope generators, an 8-channel modulation matrix, 32-step control sequencer, arpeggiator, and 4 simultaneous effects with over 30 algorithms to choose from. 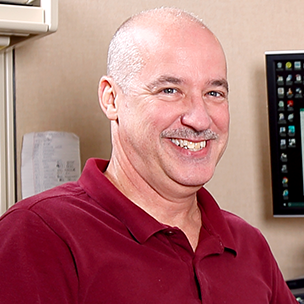 It contains a total of 1,024 Programs, or "patches", arranged in 8 banks of 128, all of which can be overwritten. Its 37 semi-weighted full-size keys feature velocity sensing and after-touch while the front panel's 26 sliders, 33 buttons, 3 rotary controls, 2 wheels, and a large backlit LCD provide ample control for unlimited sound creation. Oscillators: At the core of the DeepMind 6's sound are its analog oscillators. The signal path for each waveform is also purely analog with the pitch being digitally controlled for tuning accuracy and stability. Each of the 6 voices has 2 oscillators, which can be used independently or together, and a global Noise source is available as well. Oscillator Sync and Pulse-Width Modulation (PWM) are available along with Unison mode which can stack up to 6 voices per note. The Oscillator section also includes a Unison Detune function that varies the de-tuning of the Unison voices, as well as an oscillator Drift parameter that randomly varies the tuning of the oscillators slightly, mimicking the oscillator drift of older analog synthesizers. This tends to add "warmth" and movement to the sound. The DeepMind 6 offers 10 different oscillator modes: Poly, Unison-2, -3, -4, -6, Mono, and Mono-2, -3, -4, -6. OSC1: Oscillator 1 can generate two different waveforms that can be combined or run independently - Sawtooth and Pulse. Pitch Modulation is available for both waveforms, while Pulse Width Modulation (PWM) is available for the Pulse wave. OSC2: This oscillator generates a Square wave and has controls for Pitch Offset, Level control, as well as Pitch and Tone control modulation. Noise: The Noise generator is completely analog and produces pink noise with a gentle roll-off of lower frequencies. Filters: The DeepMind 6 includes both low-pass and high-pass filters. The low-pass analog filter has selectable 12 or 24 dB per octave slopes with Resonance (capable of self-oscillation) and includes dedicated controls for Envelope and LFO amounts as well as keyboard tracking. The high-pass filter has a 6 dB per octave slope and includes a Boost switch which applies a +12 dB boost to the signal path fattening up the bottom end. Envelopes: Three envelopes are included on the DeepMind 6: VCA, VCF, and MOD, each with 4 stages (Attack, Decay, Sustain, and Release). The envelope section has dedicated sliders for each of the 4 stages (ADSR) along with selector buttons for each of the envelope types. A Curves button switches the operation of the ADSR faders from adjusting the envelope to adjusting the curve of each stage of the envelope, allowing linear, exponential and reverse exponential curves. VCA: Is used to adjust the level or volume of the note being played over time. VCF: Is used to adjust the cut-off frequency of the filter for each note over time. MOD: This envelope can be used to modulate any of the Mod Matrix destinations for each note being played over time. LFOs: The DeepMind 6 offers 2 LFOs (Low Frequency Oscillators) per voice with a rate, or speed, that can extend into the audible range. LFOs are used to modulate other parameters for effects such as vibrato or tremolo. 7 waveform shapes are available: Sine, Triangle, Square, Ramp Up, Ramp Down, Sample and Hold, and Sample and Glide. Each of the LFOs features adjustable slew-rate, modulation delay, key sync, assignable clock sync (internal or external MIDI), envelope auto-triggering, as well as delay and fade-in. The LFOs are also Mod Matrix sources and can be applied to any of 130 destinations. A Phase Link option is available for the polyphonic LFOs, allowing them to operate in Unison (Mono), or link with an adjustable phase shift between voices. The LFOs can also track key pitch via the Modulation Matrix, enabling cross-modulation type effects. The LFOs rate can range from 0 to 255, or 0.041 Hz (24.1 sec) to 65.4 Hz (15.3 ms). Modulation Matrix: One of the most powerful aspects of the DeepMind 6 is the Modulation Matrix. Modulation is the process of controlling one or more properties (destinations) of a signal using another signal (source), such as using an sine wave LFO to vary the Filter Cutoff frequency up and down as if you were moving the Cutoff slider manually. The DeepMind 6 Modulation Matrix has 8 channels or "busses", each of which can have one of 19 Modulation Sources controlling one of 130 possible Destinations. Three parameters are available for each channel: Source, Destination, and Depth (amount). Enable: Turns the Control Sequencer On/Off. Clock Divider: Allows you to divide the Master BPM in a number of ways. Divisions can range from 4 bars to 1/64 note resolution. Length: Adjusts the length, or number of steps, in the Control Sequence. Swing: Allows you to adjust the Swing or "groove" of the Control Sequence. Slew-Rate: The Slew-Rate is the rate at which the value changes from one step to another. With a high slew-rate you will get a sloped transition between steps while a rate of 0 will give you an instantaneous change from one step to another. Loop On: This option makes the Control Sequencer loop continuously and won't restart when keys are pressed. Key Sync On: Forces the Control Sequence to restart when a key is pressed, but will not loop. Key&Loop On: Makes the Control Sequence loop continuously and also forces a reset when keys are pressed. Key-Sync: On/Off. On makes the Arpeggiator start playing as soon as a key is pressed. Off will start the Arpeggiator playing using the Master BPM (internal or external) and Arp Clock as its timing source. Oct: This determines how many octaves the Arpeggiator will cover when playing. Range is 1 - 6. Mode: This allows you to select how the notes in a Pattern will be played back. The 11 options are: Up, Down, Up - Down, Up - Inv, Down - Inv, Up - Dn - Inv, Up - Alt, Down - Alt, Rand, Chord, and As Played. Hold: On/off. Determines if the Pattern will keep playing after the last key is let go. Clock Divider: Allows the Master BPM to be divided in different ways. Time signatures available are: 1/2, 3/8, 1/3, 1/4, 3/16, 1/6, 1/8, 3/32, 1/12, 1/16, 1/24, 1/32, and 1/48. Rate (BPM): Sets the tempo of the Pattern (when using internal clock). Range is from 20.0 to 275.0 BPM. Swing: Allows you to adjust the swing or "groove" of the Arpeggiator. Range is from 50% to 75%. Pattern: This option allows you to select one of the 64 Arpeggiator Patterns: Presets 0 - 32 and User 0 - 32 . Chord/Poly Chords: Another feature of the DeepMind 6 that adds a lot of flexibility is the ability to program cords that can be played with a single key press. In Chord mode you can program a single cord, up to 6 notes, to be mapped across the entire keyboard and in Poly Chord mode, multiple chords can be mapped to any of the 37 keys. The DeepMind 6 has enough storage space for 36 six-note chords. Keyboard: The DeepMind 6 keyboard has 37 full-sized velocity-sensitive keys, with aftertouch, that can have one of three different selectable velocity and aftertouch curves to match any playing style. Aftertouch can be assigned as a Source, in the Mod Matrix, allowing it to control any Destination parameter such as volume, pitch, color, etc. Polyphonic Portamento: The DeepMind 6 features Polyphonic Portamento that lets you create smooth mono and polyphonic glissandos between notes played. The Portamento time, or "glide time", can range from 0 (instant note change) up to 255 (10 seconds of glide) and a Porta-Mode setting gives 14 different options allowing the Portamento function to operate in different ways. There's also a setting to balance the amount of Portamento between the two oscillators. FX Slots: These are the 4 slots you can assign Effect modules into. FX Routing: This section offers 10 different routing options for the 4 Effect slots with selections including: Serial, Parallel, various combinations of Serial/Parallel, and Serial with Feedback. FX Mode: Determines how the Effects will be configured. Options are: Insert, Send/Return, and Bypass modes. Mix: Each Effect slot has a Mix option that controls how much of the original sound is blended with the effected sound. Level: This controls the output level of any Effects which are configured in parallel or any Effects which are the last ones before reaching the output stage. Remote Control: Comprehensive remote control over USB or MIDI is available for the DeepMind 6 via apps for iPad, PC, Mac, and selected Androids. The iPad app also features a robust preset manager, gig list editor, and integral Patch Morpher. Main Section: This section contains all the main navigation controls for the DeepMind 6. Display: The large backlit LCD screen shows the synthesizer status, parameters, and the five main menus. Brightness and contrast adjustments are available for the display. Navigation: These controls are used to navigate the display menus. A large rotary knob is provided surrounded by buttons for Bank/Up, Bank/Down, -/No, and +/Yes. Main Menu Buttons: These 5 buttons access the main sections of the DeepMind 6. Prog: Shows the current Program, the currently adjusted parameter, and a visual representation of the parameter and the three Envelopes. FX: This button accesses the Effects and Effect options. Global: This selection lets you adjust the Global settings for the synthesizer which are divided into 5 main sections: Connectivity, Keyboard, Pedal, Panel, and System. Compare: The Compare function lets you compare your edited version of a Program with the original stored version. Write: Lets you store the currently edited Program as well as rename it. Data Entry: This fader lets you adjust the parameter selected in the display. This is similar to the Navigation rotary knob, but not as detailed, allowing rapid parameter adjustment changes. Mod: This button opens the Modulation Matrix on the display, showing all 8 Modulation Sources and their Destinations. Arp/Seq: This section contains the controls for the Arpeggiator, Control Sequencer, and Chord functions. Rate: This fader adjusts the Rate (speed) of the Arp/Seq in beats per minute. Gate Time: This fader adjusts the duration of the note being played based on a percentage of the time between triggered notes. Chord: Allows you to play any chord with a single key. The chord is given a root note and mapped across the keyboard. Poly Chord: Lets you play multiple chords that are mapped to individual keys. On/Off: Activates/de-activates the Arpeggiator. The Control Sequencer is turned on/off from its edit page only. Tap/Hold: Tapping this button in time with your performance will set the rate/BPM for the Arpeggiator. Pressing and holding this button will activate the HOLD function, which keeps the Arp/Seq running after any key has been pressed and let go. Edit: This button allows additional editing of the Arp/Seq function. LFO 1&2: This section contains the controls for both LFOs. LFO Waveforms: Seven LEDs for each LFO display which of the 7 waveform types is being used. Rate: Sets the rate or speed of the LFO. Each of the two LFOs has its own Rate fader. Delay Time: This control (one per LFO) determines the amount of time before the LFO starts to affect the signal after a key has been pressed. Edit: Allows additional LFO parameters to be edited. Both LFOs have their own Edit button. OSC 1&2: This section contains the parameters for both Oscillators and Noise. Waveform Buttons: Oscillator 1 has two buttons for selecting the Sawtooth and Pulse waveforms with both being available individually or simultaneously. Pitch Mod: Controls the amount of modulation applied to Osc 1's pitch. PWM: This fader varies the Pulse Width of Osc 1 if using the Pulse waveform. Pitch Mod: Controls the amount of modulation applied to Osc 2's pitch. Tone Mod: Controls the amount of tone modulation applied to Osc 2. Pitch: This fader adjusts the base pitch of Osc 2. Level: This fader adjusts the overall level (volume) of Osc 2 in relation to Osc 1. Sync: The Sync button allows both Oscillator's duty cycles to be synchronized, producing a distinctive sound. Edit: This button accesses additional OSC parameters to be edited in the display. Noise Level: Controls the amount of Noise added to the Oscillators or used individually. Unison Detune: This fader determines the amount of detuning between voices when Unison mode is active. Edit: Allows additional Poly parameters to be edited from the display. VCF: The VCF (Voltage Controlled Filter) section contains all the parameters for the low-pass filter of the synth. Freq: This fader varies the filter cut-off point. Res: The Resonance fader applies a boost at the filter cut-off point. Env: This fader controls how much the Filter Envelope is applied to the filter. LFO: Adjusts the depth of the LFO waveform applied to the filter cut-off frequency. KYBD: Adjusts the amount of keyboard tracking applied to the filter cut-off frequency. 2-Pole: This button switches the low-pass filter from a 4-pole (24 dB/octave slope) to a 2-pole (12 dB/octave) slope. Invert: This button will invert the polarity of the VCF envelope applied to the filter cut-off frequency. Edit: Allows additional VCF parameters to be edited from the main display. VCA: The VCA (Voltage Controlled Amplifier) is used to control the output level. Level: Controls the output level of the VCA. Edit: Allows additional VCA parameters to be edited from the main display. HPF: This section pertains to the High-pass filter section of the DeepMind 6. Freq: This fader determines the frequency of the High-pass filter. Boost: The Boost button applies a +12 dB bass boost to the signal path. Envelopes: This section contains the controls for the 3 Envelopes used to modulate other parameters. ADSR: These 4 faders are used to adjust the Attack, Decay, Sustain, and Release parameters for each Envelope. VCA: Selects the Envelope to control the VCA. VCF: Selects the Envelope to control the VCF. MOD: Selects the Envelope for user-specific modulation. Curves: This button changes the ADSR controls to affect the associated curves for each stage of the Envelope. Portamento knob: Allows you to quickly vary the Portamento timing without entering a menu. Oct Up/Down Buttons: Allows the key range to be raised or lowered by up to 2 octaves. Octave: 5 LEDs display what octave range the keyboard is set to. Voices: 6 LEDs light to show how many Voices are sounding when keys are pressed or when the Arpeggiator is triggering notes. Power Consumption: 55 W max. Searches related to the Behringer DeepMind 6 Analog 6-voice polyphonic synthesizer.